I don’t know if anyone has researched the origin of the television marathon, but the first time I became aware of such a thing was probably the holiday bingeathon of The Twilight Zone. If I remember correctly, it was WPIX in New York that would fill a day’s programming — New Year’s Day, maybe 4th of July — with nothing but episodes of Rod Serling’s sci-fi tales. 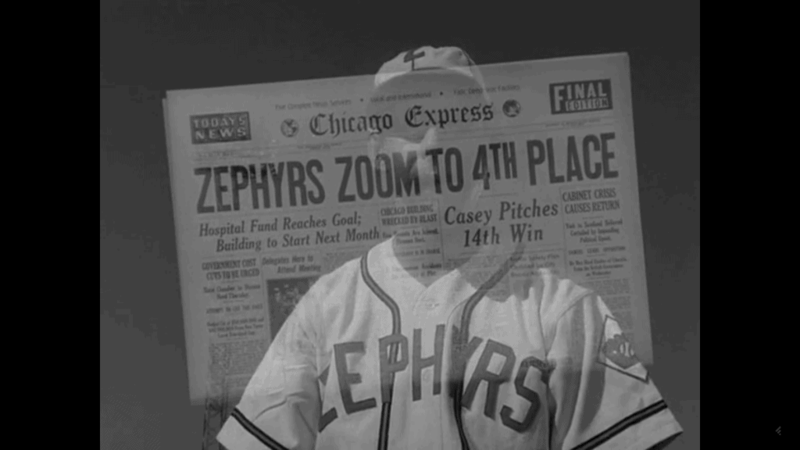 But it wasn’t until I was browsing through the new offerings from Ebbets Field Flannels one day a few years ago that I learned of a baseball-themed episode called “The Mighty Casey.” Ebbets had created a replica jersey for the Hoboken Zephyrs, a team from New Jersey I’d never heard of. It only took a quick search of the name to discover the origin of the name and why I hadn’t known about this team. 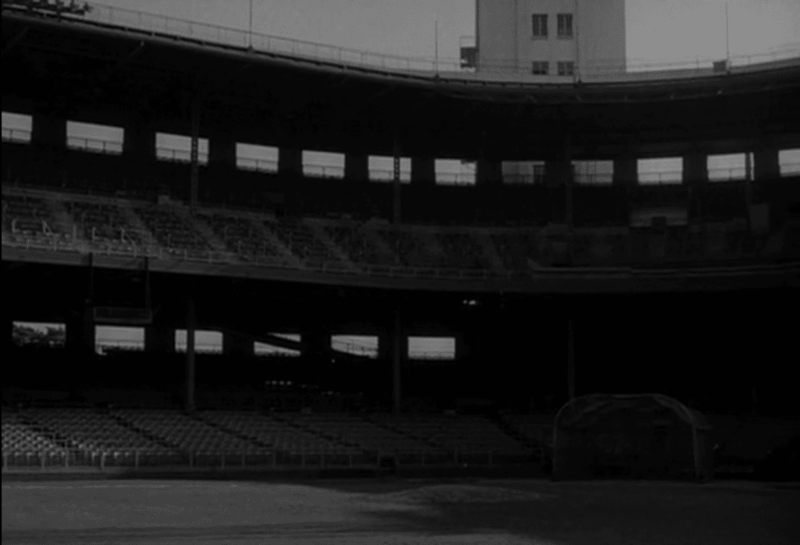 The 35th episode of Season 1 of The Twilight Zone, “The Mighty Casey” aired on June 17, 1960, the day Ted Williams became the fourth player to hit 500 home runs, reaching the milestone in a 3-1 win at Cleveland’s Municipal Stadium. The episode was news to me, so I sought it out to watch. With the story airing again today at 3:30 p.m. ET as part of Syfy’s New Year’s marathon, I figured now’s as good a time as any to delve into the show. 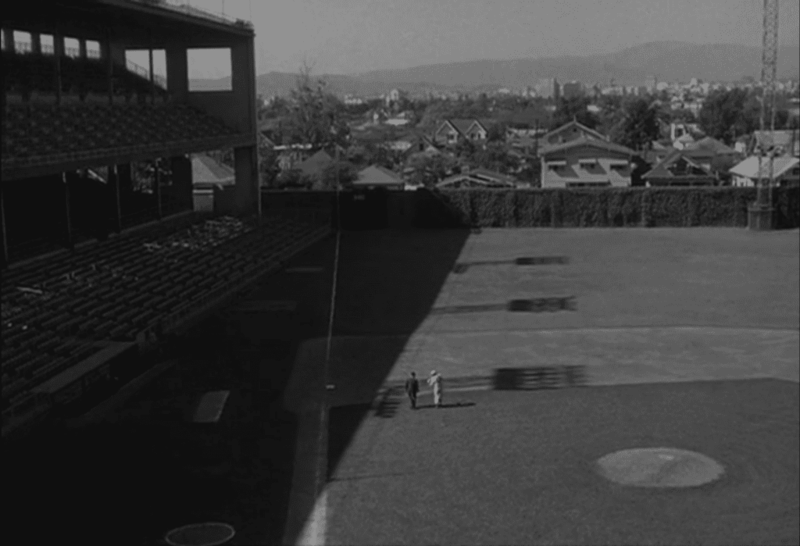 Serling’s introductory voice-over tells us we’re looking at a ghost: The former ballpark where the Hoboken Zephyrs of the National League played. But when we catch a glimpse of the tower behind home plate, it’s clear this is Los Angeles’ Wrigley Field, once again the scene for a Hollywood production. 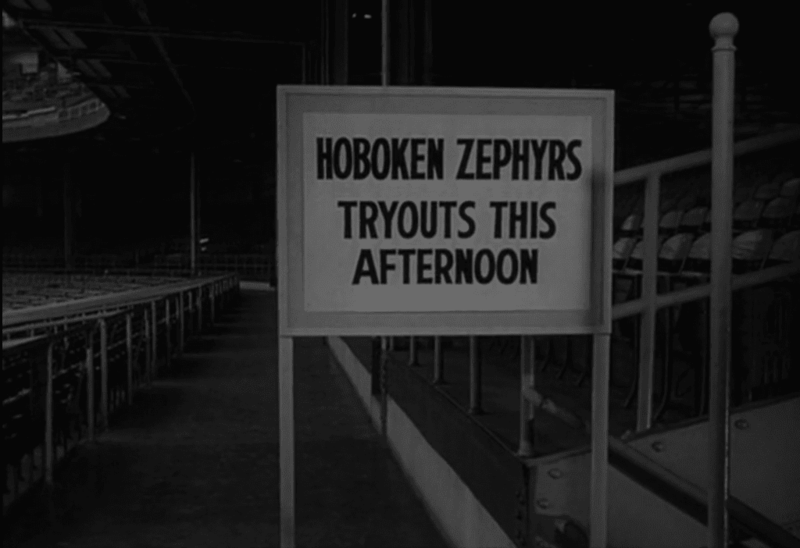 The Zephyrs are abysmal, sitting in last place, 31 games out, and are holding a tryout for new recruits. 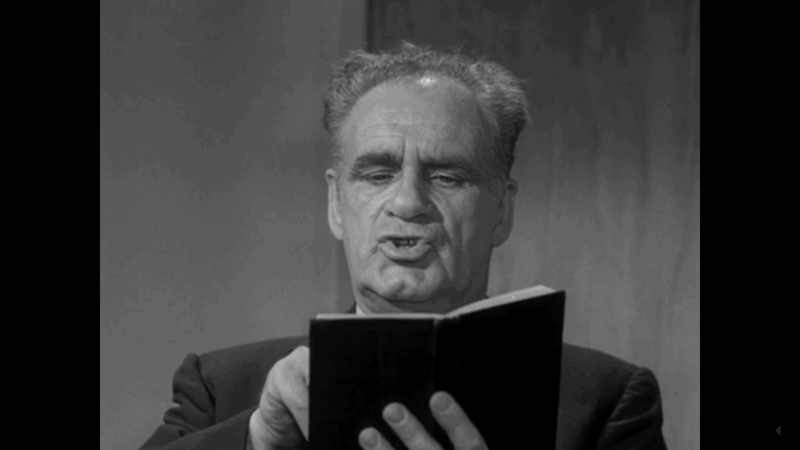 Guiding this sad sack of players is “Mouth” McGarry, played by a then-40-year-old Jack Warden, a Newark-born gent you might remember as the kind neighbor to the Callahan family in “While You Were Sleeping.” This was Warden’s second Twilight Zone episode, after “The Lonely,” the seventh installment of the show’s first season. 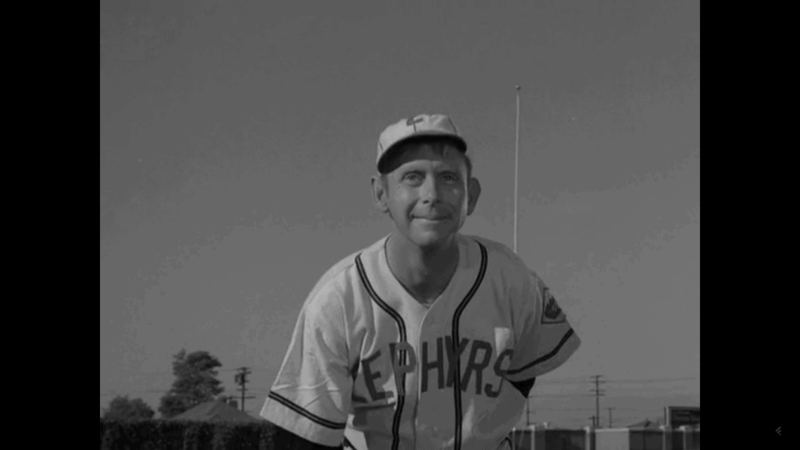 Also among Warden’s long list of credits is the 1979-80 TV series The Bad News Bears, in which he played Morris Buttermaker. Along comes Dr. Stillman, who presents Casey, a lanky left-handed pitcher who comes walking through the dugout, cap and glove in hand and a quiet, quirky expression on his face. When he stops in his tracks and turns to follow the path of a foul ball until it bounces off his head, it’s immediately clear that he’s a little odd. Unfazed, he continues along to Dr. Stillman and McGarry, whose hand he crushes in a vice-grip of a handshake. A 30-year-old Robert Sorrells plays Casey in his fourth role. His career would include roles in TV’s Route 66 and The Fugitive (like Warden) and movies such as The Bad News Bears Go To Japan and Fletch. 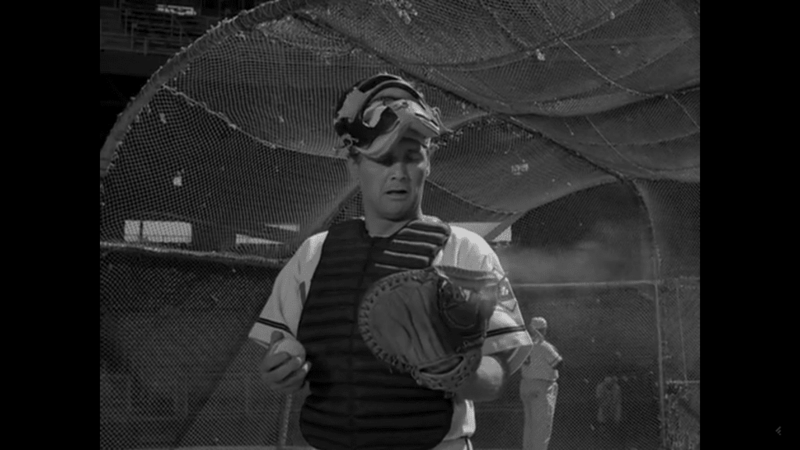 After stepping behind the catcher to get a closer look at the fastball and slow ball, McGarry decides he can work with Casey, as raw as he is — but no mention of his being a robot, he tells Dr. Stillman. 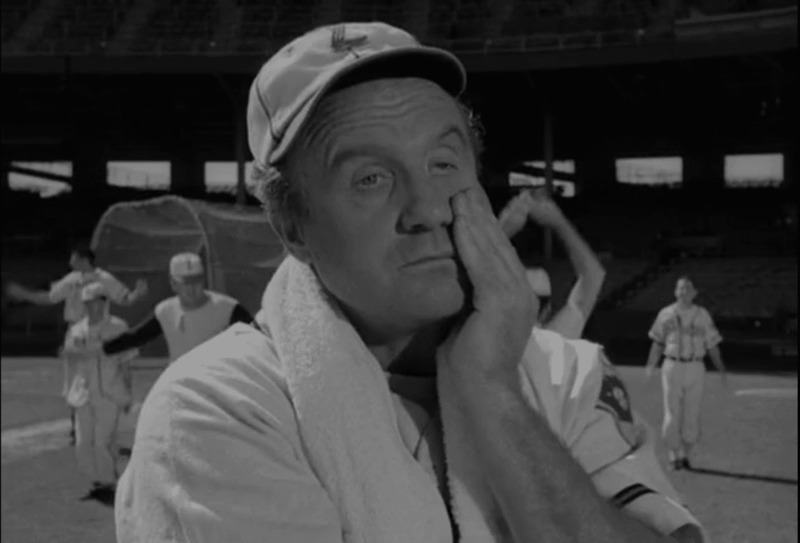 Before Casey’s first game, McGarry tries to reasurre his new pitcher by telling him not to be nervous — a foreign concept to the robot left-hander. When the show aired, DiMaggio had been retired for nine years and in the Hall of Fame for five. 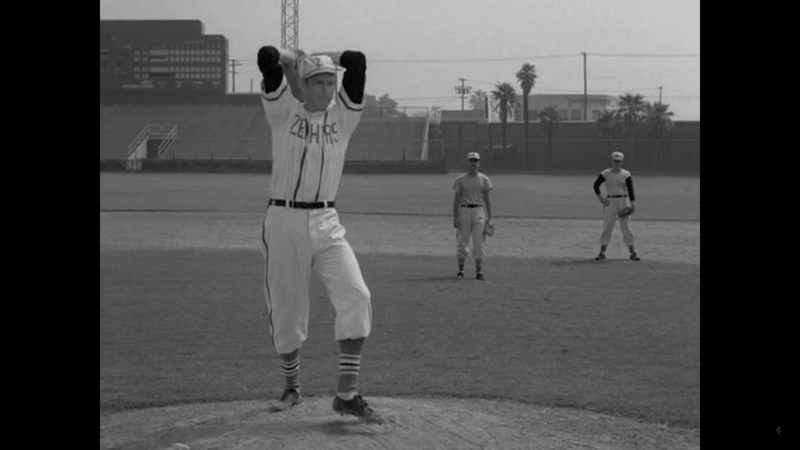 Casey takes the mound for his first game, against the New York Giants, and Dr. Stillman explains that in order to prove Casey’s ability as a “super man,” he had to have him pitch for “absolutely the worst ball team I could find.” McGarry shakes his head. To put those accomplishments into perspective, the three shutouts (assuming they were his first three starts) would have tied the Major League record to open a career, accomplished only once, by the Boston Braves’ Art Nehf in his first three starts in 1915. 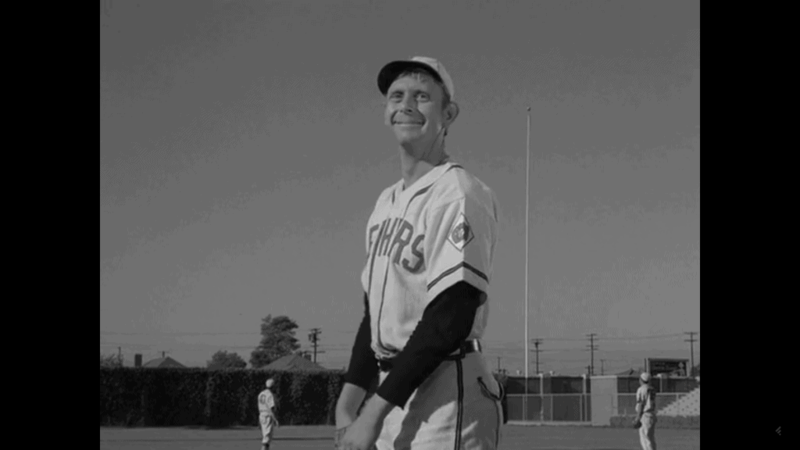 Eighteen strikeouts in a game would have also tied the record at the time, held by Bob Feller (done in 1938), Warren Spahn (1952) and Sandy Koufax (Aug. 31, 1959, less than a year before the episode premiered). Hoboken’s rise from last place, 21 games out of fourth (as the general manager, Beasley, laid out in an earlier scene), probably doesn’t have a comparison, as fantastical as it is. But the success soon ends, when Casey gets beaned and ends up in a hospital bed. The general manager, Dr. Stillman and McGarry surround the team doctor as he examines the robot pitcher, only to find “no fracture, no concussion, reflexes seem normal. I think you’re going to be alright, Casey.” But the doctor’s concern grows when he tries to find Casey’s pulse — and hears silence, of course. McGarry steps in, but too late. He has no choice but to come clean to the GM, but before he can, Dr. Stillman reveals the secret to the team doctor, who says he must inform the commissioner. “He had me fooled, even without one,” the team doctor interjects. At the time, Leo Durocher was five years removed from being the manager of the Giants and still six years away from taking over the Cubs. 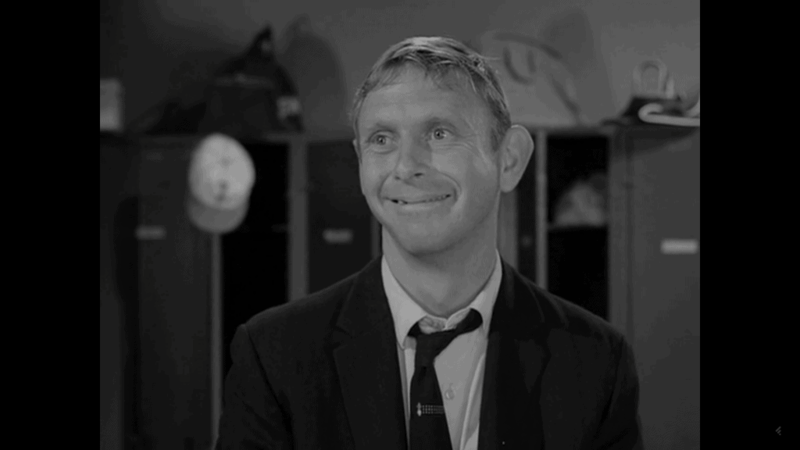 He must’ve spent those interim years in The Twilight Zone. “The Hoboken Zephyrs win the pennant for the first time in 23 years,” McGarry says. At this point, Casey walks in wearing a suit, Dr. Stillman following, but McGarry doesn’t notice. McGarry sees Casey, but it doesn’t register. “Hiya, Casey,” he says, then turns back to the team. “And I tell you something else about the big guy. He has got a heart.” He pauses, then turns to Casey again. “CASEY!” The team realizes he’s there now, too, and jumps up to welcome him back with handshakes. Casey opens his suit jacket and invites McGarry to hear his ticking heart. The smile was a harbinger, though. Casey winds up, maintaining his grin, and a big right-handed hitter for the visiting team deposits the pitch over the left-field wall. Casey smiles, turns toward his dugout, and raises his gloved hand to wave. More pitches, more runs, Casey smiling the whole time. 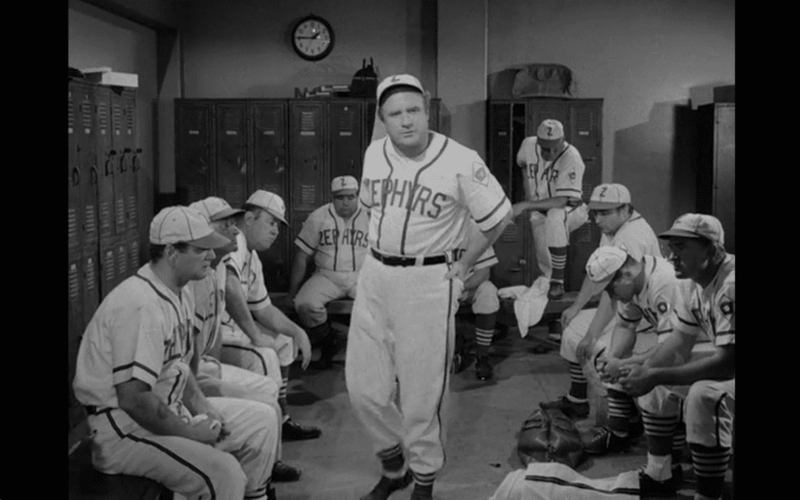 After the game, McGarry enters the clubhouse, where a suited Casey and Dr. Stillman wait. Feller had been retired for four years, last pitching in ’56, but was still two years away from induction to the Hall of Fame. 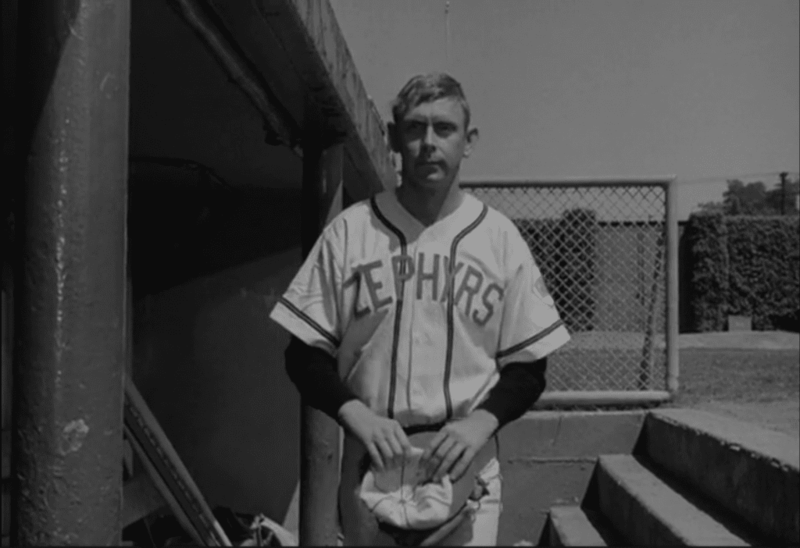 And with that, the greatest pitcher in Hoboken Zephyrs history walks out of the clubhouse. Dr. Stillman leaves McGarry with Casey’s blueprints, hoping to cheer up the old skipper. McGarry sees something he likes and runs after Stillman, catching up with him on the infield as Serling’s voiceover returns.